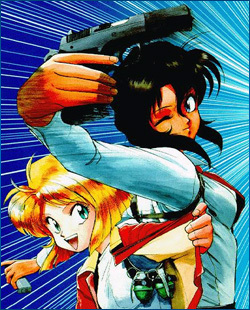 OSMcast: Gunsmith Cats 02-16-2009 – OSMcast! Look out because the OSMcast! is updating on time! For this episode we decided to tackle the manga and anime series by Kenichi Sonoda, Gunsmith Cats. Protip: Ignore the fact that I think the music that we ended up playing was from Riding Bean. We can’t help the fact that we’re hustlers. Promo: Anime World Order! These guys certainly don’t need any of our help finding listeners, but they were the first podcast to play our promos. So we thought we’d return the favor. I have yet to get a bad recommendation from them, even if it’s for all the wrong reasons. Usually however, they’re good ones. Sadly, the Gunsmith Cats DVD is severely out of print and plan on paying $30+ if you want the DVD. However the manga is easily found and at some pretty decent prices too. And it looks like we’ll be returning to MTAC this year! It should be quite fun! I’ve heard there might be a podcasting panel or two, so we are going to try to crash get invited to them. Last year was good times and I see no reason why this year should be any different. It’s April 3rd through the 5th, in Nashville at the Sheraton Music City hotel. And don’t forget, the contest still exists! The rules for this contest are very simple! You just have to talk to us! No matter what, we’ll need an email. You can send us one at osmcast@gmail.com. Also, you could leave us a comment in the comments section below this post. Or call us up on the OSMline at (206) 202-0071. However you do it though, we’ll need an email to contact you. As for the prize, well we are having this conest till the end of February so before then we’ll let you know! This entry was posted in anime, Gunsmith Cats, manga, OSMcast, podcast and tagged anime, Gunsmith Cats, podcast by Basil. Bookmark the permalink. Malev…. that’s a terribly frightening prize. I’m not sure I want to win. See you guys at MTAC.